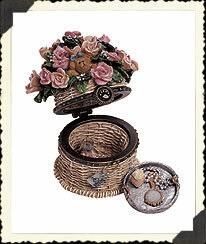 This intricately sculpted treasure box is pretty enough to display with jewelry and perfume bottles on Mom's vanity top! 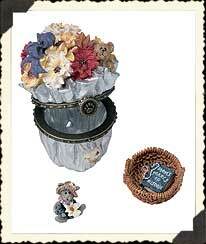 The rose-covered "basket" opens to reveal a special Mother's Day message on the inside lid; a "silver" tray with special treasures; and at the bottom, a mini McNibble mouse, holdin' a precious pink rose for Mom! This Treasure Box basket is bloomin' with fresh flowers-red roses, white azaleas, foliage, and ivy are burstin' from the top. Pop the lid to find a wicker tray filled with garden gadgets and, underneath, gardener Brie McNibble, holding a bunch of posies in his paws! A lil' trinket to remind Mom how speshull she is! 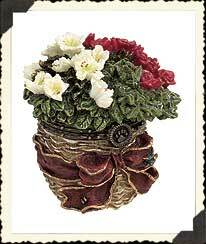 Our Uncle Bean's Treasure Box(tm) is designed in the shape of a flowerpot topped with wild Spring blooms. Open the lid to find an inspiring quote just for Mom; a removable resin "wicker" basket that holds "Mom's Pearls of Wisdom"; and, underneath, Daisy McNibble who's just picked her favorite Spring posy for her Mom! 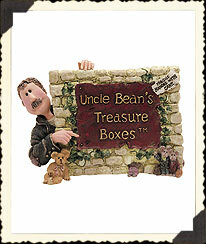 Display your favorite Uncle Bean's Treasure Boxes along with our brand new resin sign - starrin' The Head Bean Hisself! You can't miss Kendall's plaid lunchbox in a lunchroom lineup! The inside lid is a chalkboard ("I will not talk in class" is the current assignment). 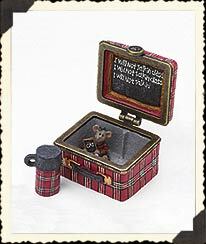 Underneath rests a miniature plaid thermos and Scholar McNibble, holding his own mini chalkboard.